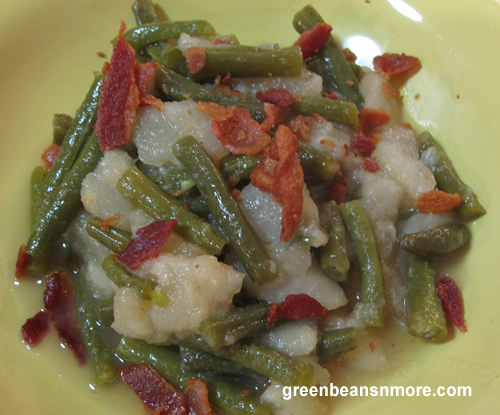 This is a German green bean recipe attributed to The Art of German Cooking by Betty Wason. It's a wonderful sweet and sour green bean recipe and would be a perfect use for your fresh, ripe, flavorful pears. Remember, the best way to assure any recipe success is using the freshest and best ingredients you can get. Place the pear slices in a sauce pan with the water and lemon peel. Bring to a boil, lower the heat, and simmer uncovered for 5 minutes. Then stir in the green beans and salt and continue cooking. Meanwhile, fry the bacon in a skillet. When the bacon is crisp, remove it to a paper towel to drain. Pour off all but about 2 tablespoons of the fat remaining in the skillet. Add the sugar, vinegar and lemon juice to the bacon fat in the pan. Simmer for 3 minutes. Pour this sauce over the pears and beans and cook until tender. Crumble the bacon and add it to the beans just before serving. Cook's Tip: As you can see from the picture above by the time I got to making this recipe the pears had gone somewhat soft. However, it was still delicious! Next time I'll buy, and use the pears on the same day, or with a day or two.